Full of energy and ready to start my day in the dark, armed with a backpack filled with almost a full 3L’s of water, a huge big dictionary and two of the biggest Lonely Planet travel guide books I own to add some extra weight along with the usual jacket, long pants, gloves, beanies and food I set out for the mountain for a nice Sunday morning hike. First I picked up Judi along the way and then it was off to the start of the hike to meet Simon, who was armed with the most delicious, warm chocolate croissants for us! The start of the hike, even though it doesn’t have a sign board for Devils Peak here the path would lead us up to the contour path that would take us to Devils Peak. 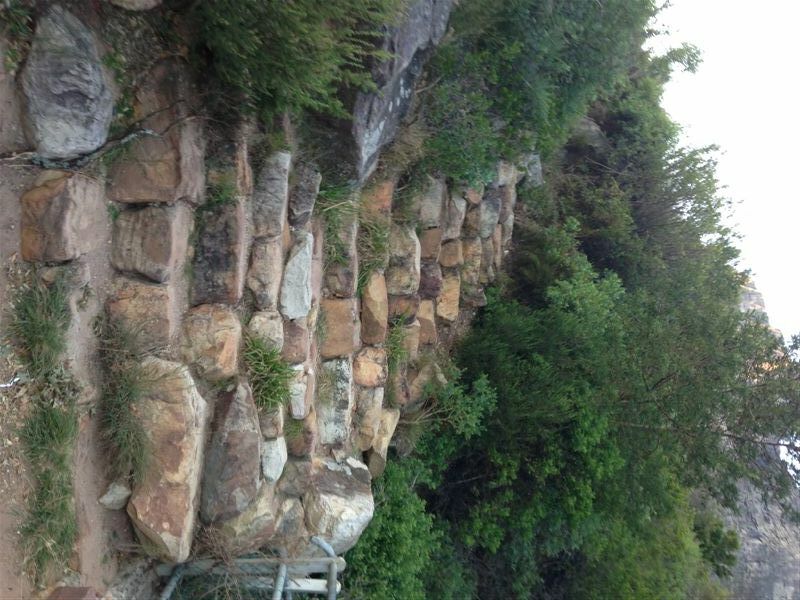 The stone stairway that would lead us straight up the mountain, with the steps becomes larger rocks and really making us work. Things are getting serious now and training for Aconcagua has begun in earnest. 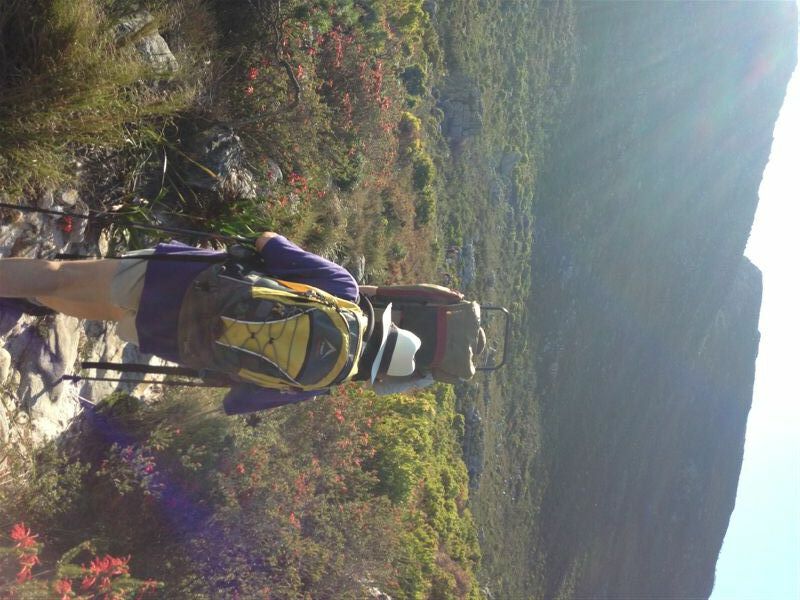 Originally, we had planned to hike the Pipe Track, up Corridor Ravine to the top of the mountain and then do some exploring of Tranquility Cracks before walking back across the back table and back down Kasteelpoort. 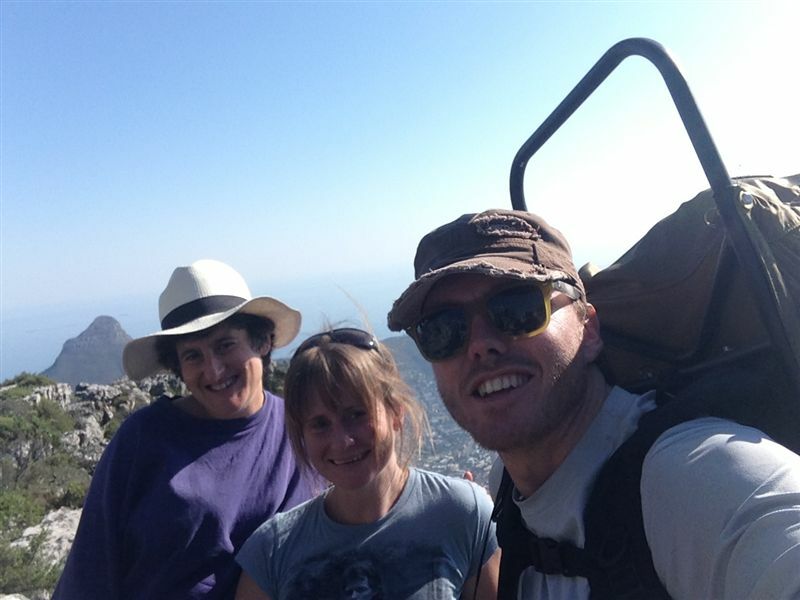 A milder hike by far but as the two people I had specifically chosen to do that hike for decided not to join us, we decided to really put the purpose of our hikes into practice and decided on Devil’s Peak instead. The soft glow over the city as the sun was about to make an appearance. 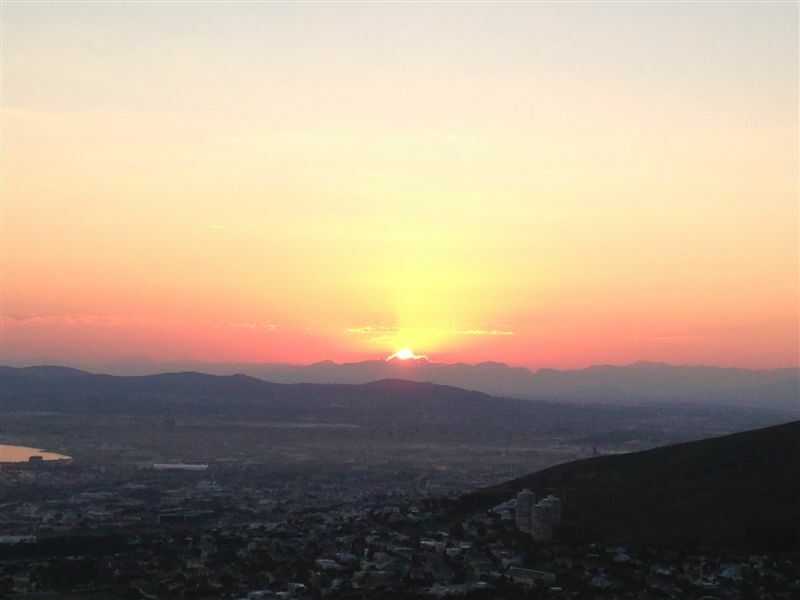 The sun rising over Cape Town below. Views like this surely make getting up early so worthwhile! 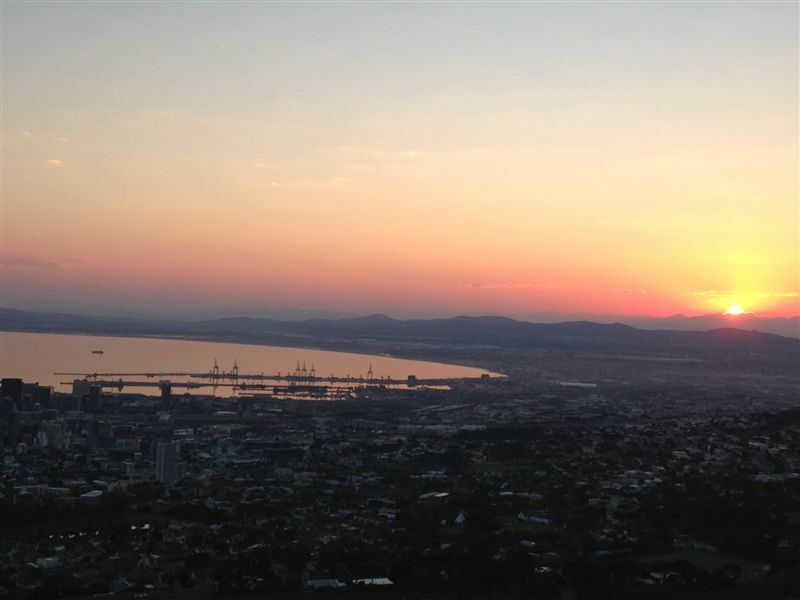 Arriving at the start, we got to watch the most beautiful sunrise over The Mother City! It is moments like this that make getting up early so worthwhile. Although Judi and I had loaded our backpacks to start training our bodies for the heavy loads we will carry on Aconcagua, Simon was the most serious of us and came armed with those old steel framed backpacks with, wait for it, with a 16kg dumbbell inside! That is over and above his water and any extra he had in his backpack. It kind of made me feel a bit inadequate with my books for weight but later I would be counting my lucky stars! As the sun rose, the three of us got our backpacks ready and armed with our trekking poles we headed up the long trail of stone steps leading directly up the mountain. Almost immediately you could feel your quad muscles pulling as you stepped up the large stone steps. With each step I reminded myself what good training this was for our legs, on Aconcagua should it be snowing we will be taking giant big steps and we’ll be thankful for these minor stone steps in comparison. Our backpack’s weighed heavy but within no time you settle down into a comfort zone and the weight becomes almost unnoticeable, except maybe if you were the one carrying the 16kg dumbbell! There was not a breath of wind and we hiked mostly in the sun, the day started out hot despite the fact we were well into the month of May and autumn. The views unfolding before us of the city below were breathtakingly beautiful, despite the fact that there was a haze hanging over the city due to the lack of wind. 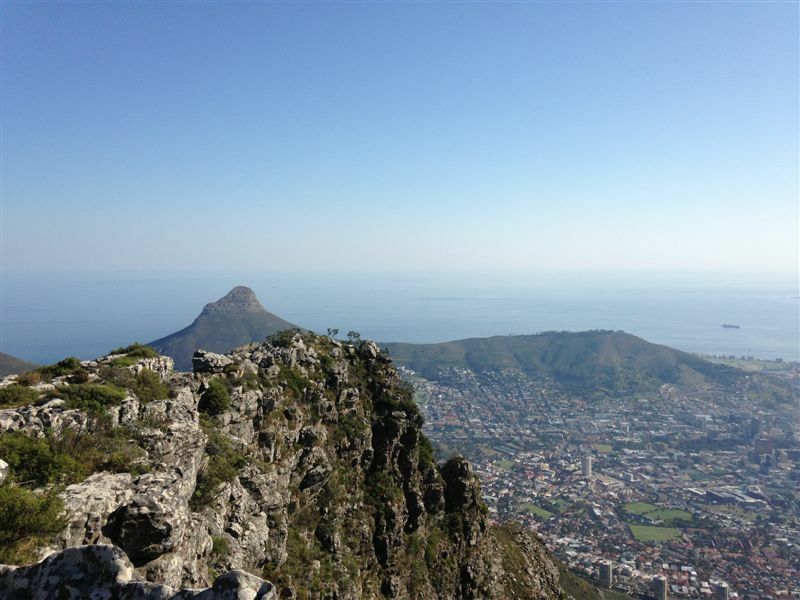 Views of Lions Head and Signal Hill protecting our beautiful city at their feet. Such a perfect day to be out on the mountain. Judi, feeling rather adventurous, decided to try out Simon’s extra heavy backpack while we had the advantage of walking on the contour path. 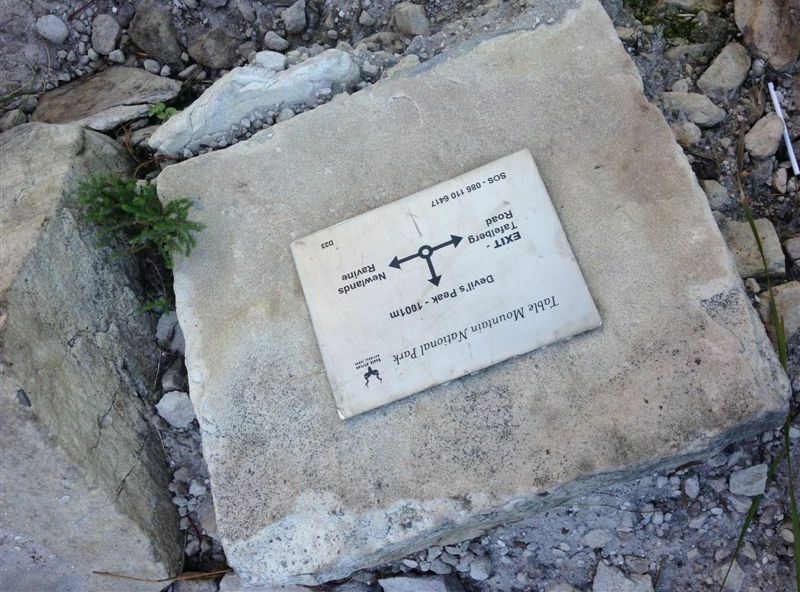 As they swapped packs around, I stood taking some photos of the view and of the signposts for the various trails. Looking back at Judi mounting the 16kg dumbbell in this old backpack out of the ark, I couldn’t help but laugh. As I watched her settle the heavy backpack on her shoulder suddenly she reached out to grab hold of Simon as the weight of the dumbbell pulled her backwards. That just finished me off completely, these two were just totally mad and watching this unfold just made me even more excited for our next adventure on a big mountain! If our first epic adventure was anything to go by, our next one was going to be even better! 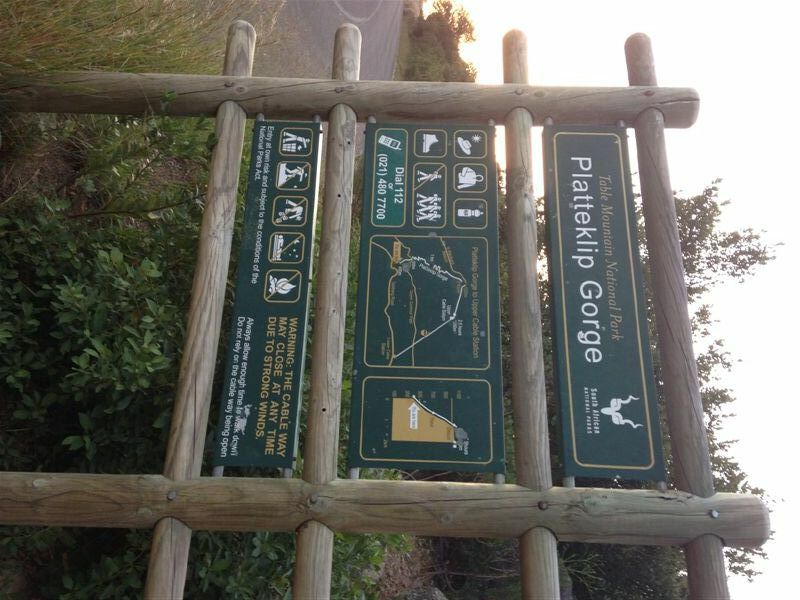 Right for Platteklip (a path of steps leading straight up the mountain) and left for Devils Peak. 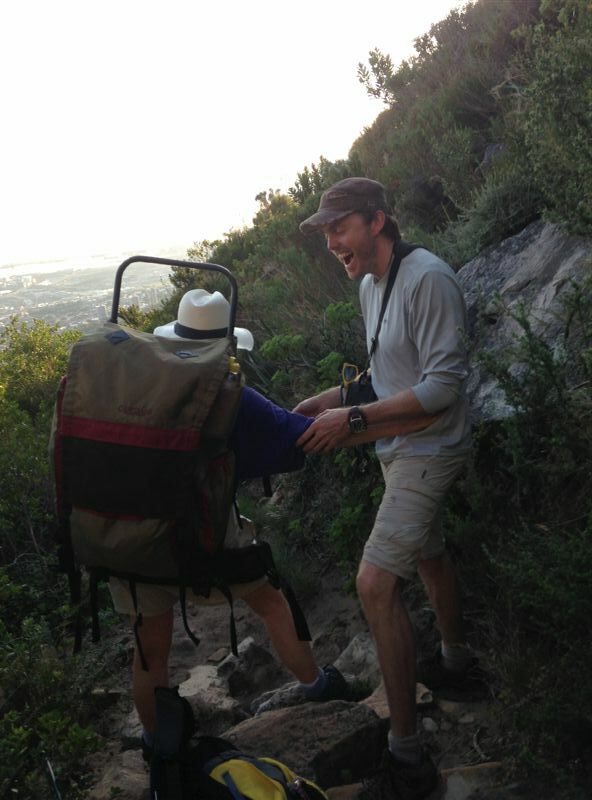 Simon only too happy to swap backpacks, helping Judi mount the dumbbell heavy backpack. The dumbbells so heavy, as Simon let go Judi started to tumble backwards. Judi did well with the heavily laden backpack but once the contour path starting zig-zagging up the mountain slope again it was time to hand it back over to Simon. The sun beating down was hot as we zig-zagged our way up, stopping every now and again to catch our breath. The heavy loads on our back making each step we took up the large stone steps that much more strenuous. Zig-Zagging our way up, we stopped in one of the few shaded spots for a quick rest. We met some incredible people on the mountain, the most vibrant spirited one called himself Alister Dream Wilder and his website by the same name can be found here. He was trail running with another guy and stopped us as he passed us commenting on our fancy trekking poles we had. We had a great chat with him about his upcoming and past adventures and told him what we had planned next. This man was full of spirit and passion and just chatting to him got me excited for where our Aconcagua team is heading. The short flat piece before the long slog up the mountain slope to the saddle of Devils Peak. 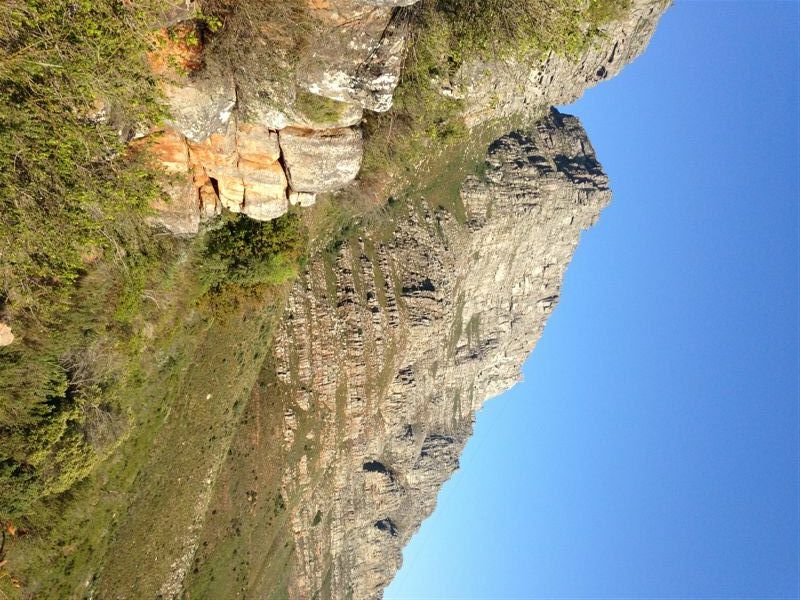 Later, the route to Tafelberg Road is where Simon would double back while trying to get to the road. 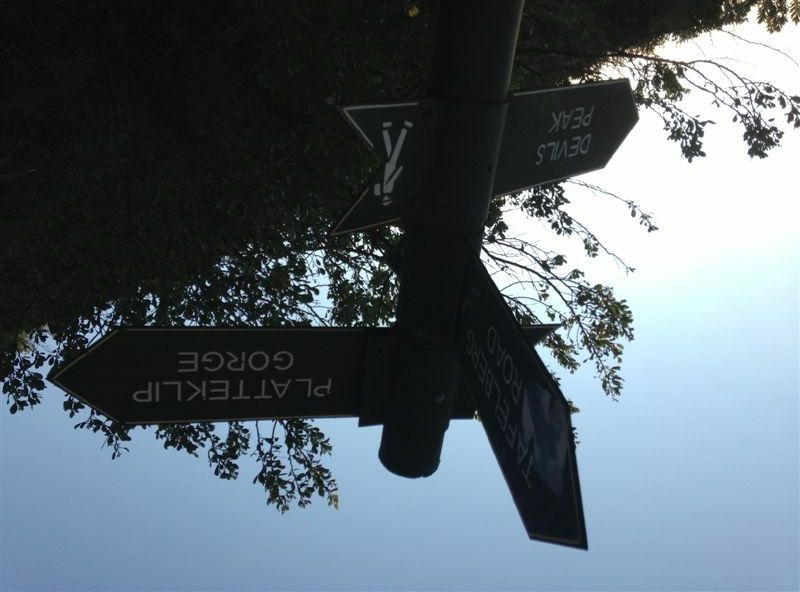 A shortcut that turned out to be the long route! Taking the next exit to Tafelberg Road would have seen him at the road a lot quicker than the route he took. The only way from here was up. A steep path to the saddle covered with loose sand and rocks. Later as we slogged up the steep mountain slope towards the saddle of Devils Peak, a lady and her daughter stopped to ask us if we were training for something, to which we excitedly replied with details of our upcoming trip. 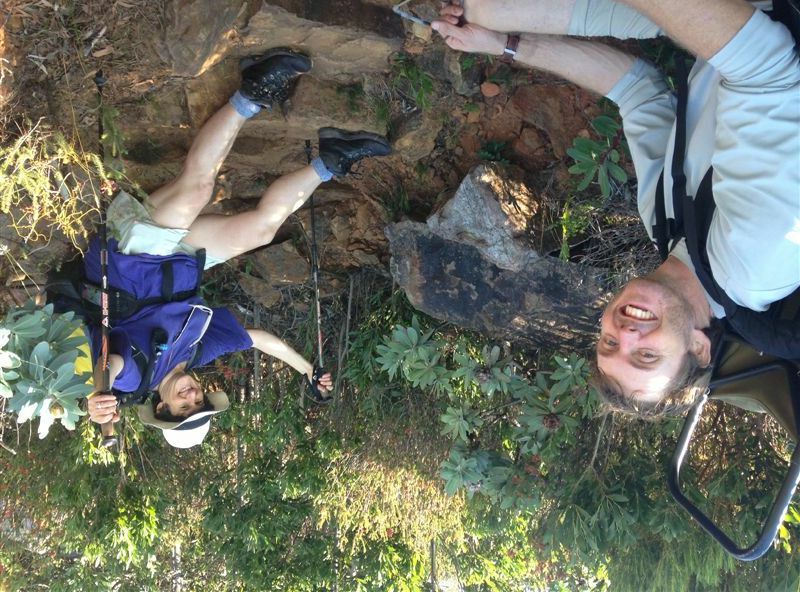 It makes me smile to know that we look the part of serious mountain climbers! A short while later as we continued to slog up the mountain side, we came across a man with a young child on his back. Nothing unusual in that except that this man was barefoot. 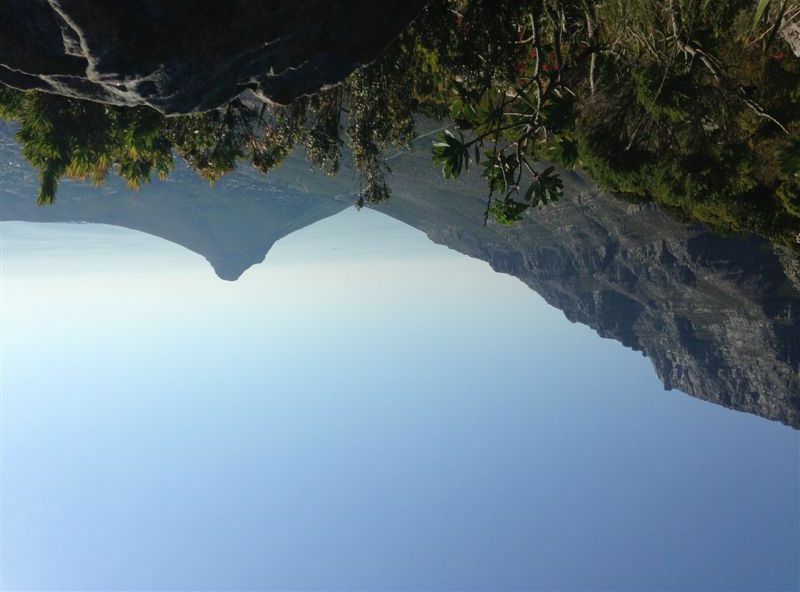 As the sun was coming over Devils Peak and looking up at the man above us, the sun blinded me. I didn’t think anything too unusual about his bare footedness as I have come across others who do trail running barefoot. My hiking companions enquired about his bare footedness and it was then through my squinting eyes I noticed the hiking shoes tied around his neck. Apparently, at some point, both this man’s shoes literally fell apart leaving the sole of each shoe flapping wildly as he walked, so before they came off completely he took them off and braved the mountain side with bare feet. This is where my hero from the slopes of Kilimanjaro stepped in and once again saved the day! Simon removed his backpack and pulled out a roll of duct tape and handed it to the man who sat down, with his kid still on his back, and began putting his socks and shoes back on and proceeded to tape the soles of his shoes back together again with Simon’s bright blue duct tape. Who would have ever thought duct tape could come to the rescue so many times on a mountain, first fixing a broken camera at some ridiculous altitude on the day you leave for base camp and now putting shoes back together again and saving a man’s feet! The man, whose name we did not ask, joked with Simon asking him if he wanted him to save a little bit of duct tape just in case he needed it later when Judi and I’s talking got too much! After a good rest and bidding farewell to the broken shoed man, his kid named Sam and his wife, we continued up to the saddle. We had not been moving super-fast and with all the stops chatting to people we were a bit behind time, but as my hiking companions said “this is what the mountain is all about.” I couldn’t agree more! Exhausted and hot, we reached the saddle and decided to stop there for lunch as Simon, who had a date with a picnic blanket on the beach for a friend’s birthday wouldn’t have time to make it all the way to the top and would have to go back down shortly. So we walked along some rocks and perched ourselves on some rocks overlooking the city below, a perfect spot for lunch! At the saddle, we found a rock to perch on and enjoyed a well deserved rest and lunch. 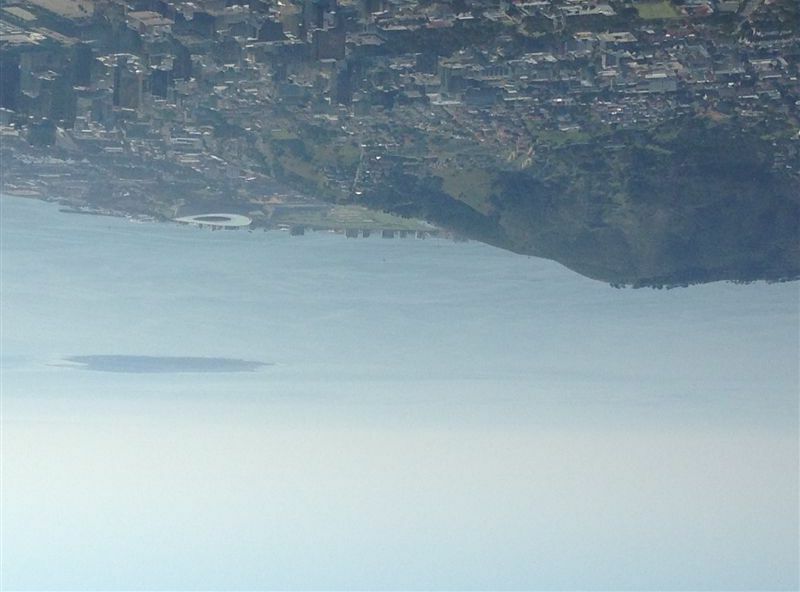 That’s Lions Head and Signal Hill in the distance with the city below and the Atlantic Ocean beyond. A bit of a hazy view of Signal Hill, The Cape Town Stadium which was built for the Soccer World Cup and Robben Island stands in the distant ocean. 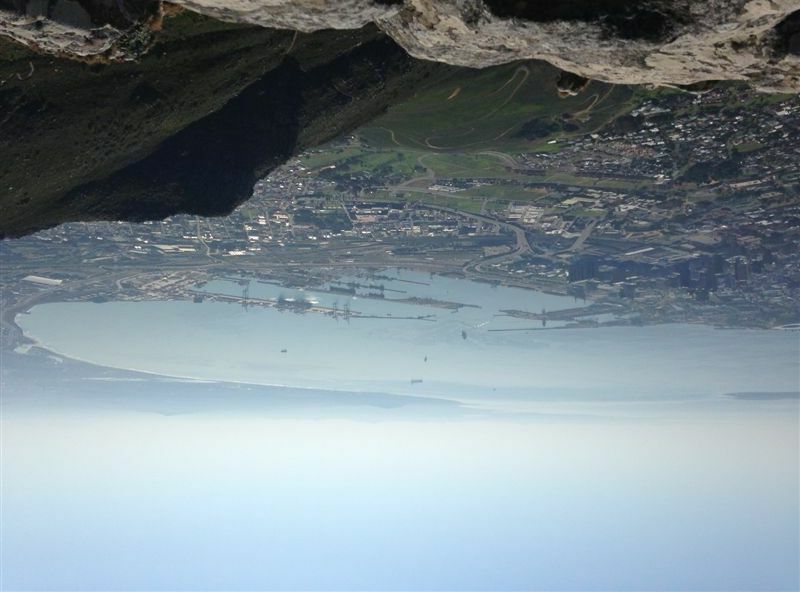 Cape Town harbour below with views spreading right across the West Coast. 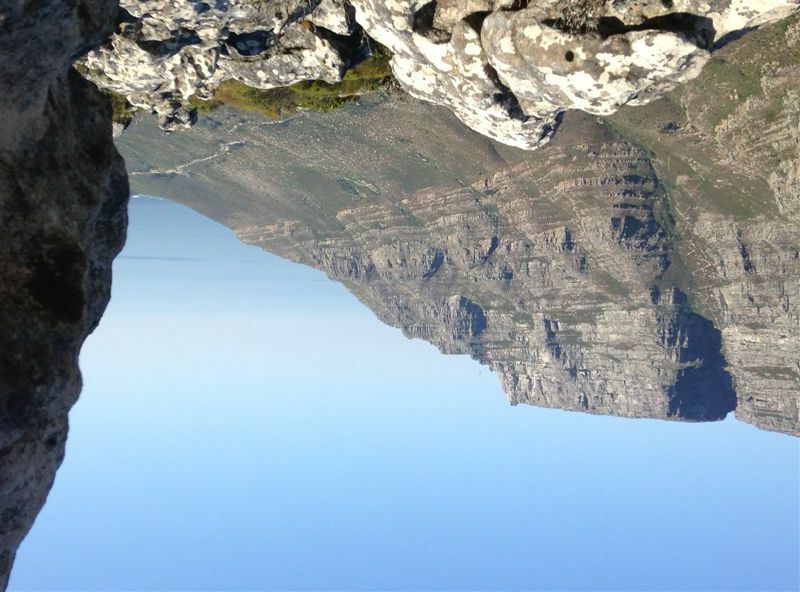 Views of Table Mountain across the way. 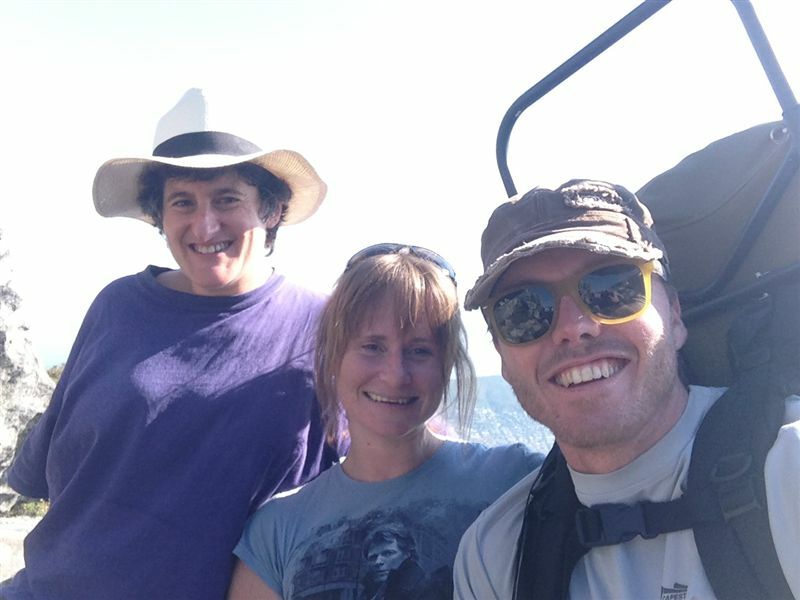 Three Kilimanjaro team members, back on the mountain and back in the full swing to train for the next of the Seven Summits. The picture with a view behind us. Up close and personal ~ the crazy nutters ready to go to new heights of 6962m above sea level ~ Our 2nd mountain of the Seven Summits! After a nice lunch and a good rest, Simon loaded up his backpack, ready to start heading back down. We said farewell and with brief instructions to take the Tafelberg exit instead of following the path we had taken up as walking the last bit on the road would be easier and quicker for him and with agreements to stay in touch to let us know he was back at his car safely, he went on his way. Judi and I, enjoying the rest, stayed there for about another hour just chatting and enjoying the spectacular view and sunshine. 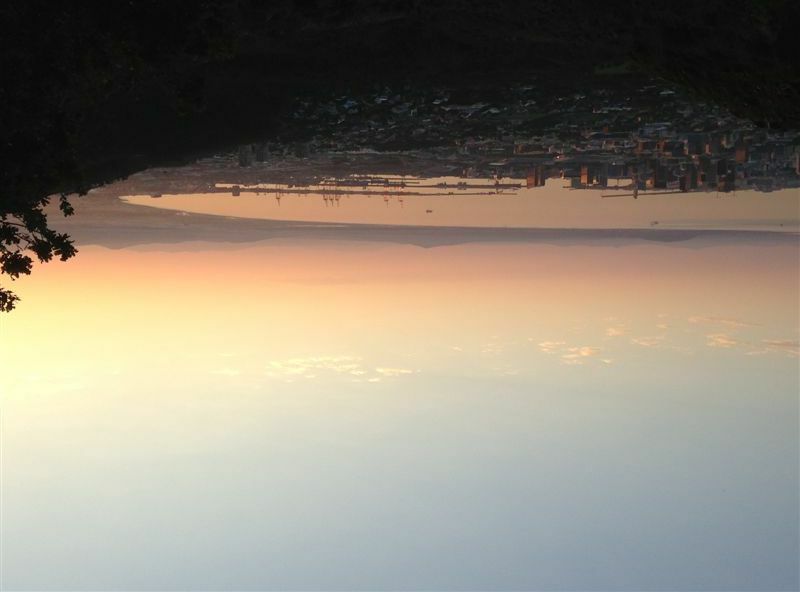 Just as we were about to leave I got a message from Simon telling us that he had taken the first alternative route to Tafelberg Road and was so far he was almost just above town, completely in the wrong direction! 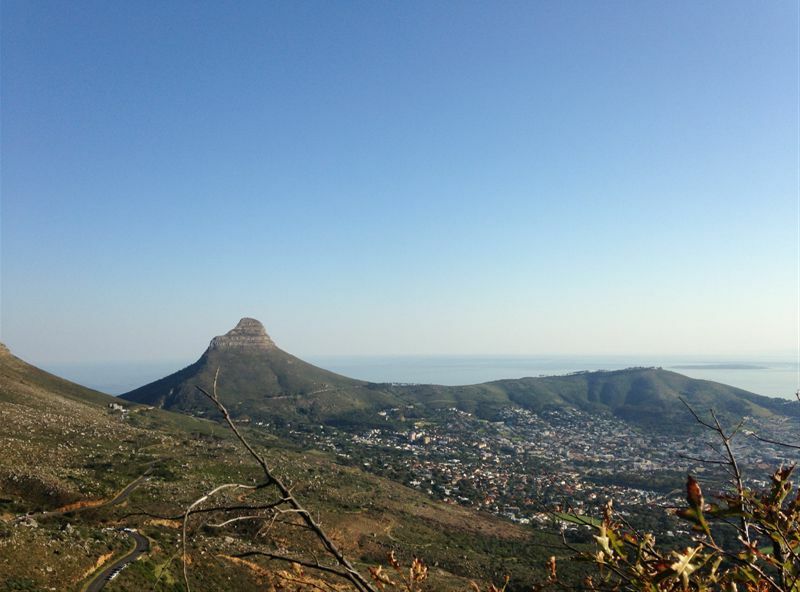 He had headed out on the exit to Tafelberg Road that takes you back around the mountain towards Rhodes Memorial! Not only was he going in the wrong direction, he was adding on a few extra kilometers! He was either enjoying his day out on the mountain or he was seriously a sucker for punishment! About 45 minutes later I got another message to say he had finally hit the road but it was a long walk back to the car and a note that his legs were so wobbly. That message completely finished me off yet again and I couldn’t stop laughing the rest of the way back to the car. 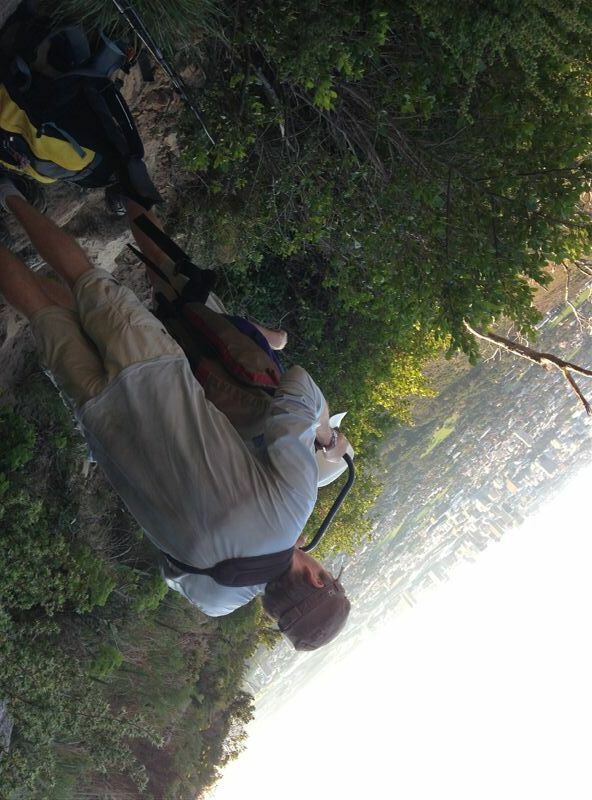 Each time I looked down at Tafelberg Road below us, I would get this image of Simon with his dumbbell in his backpack, wobbling all the way back to the car and I would just burst out laughing! A few times Judi exclaimed, “Shame on you, Lara, how can you laugh?” It was just too much for me. His next update came through saying that he could see the end goal (the car) but it was still far off. The way he was going we were going to beat him back to the car and he had an hour head start! He really must have walked so close to the Rhodes Memorial side and in the end had to double right back once he eventually made it to the road! Finally arriving back at his car safely, Judi and I had reached the overhang and for us too the cars were now in sight. A quick rest in the shade of the overhang and a quick photo to get Cape Town on the Maptia Manifesto map of the world and we were on our way again. 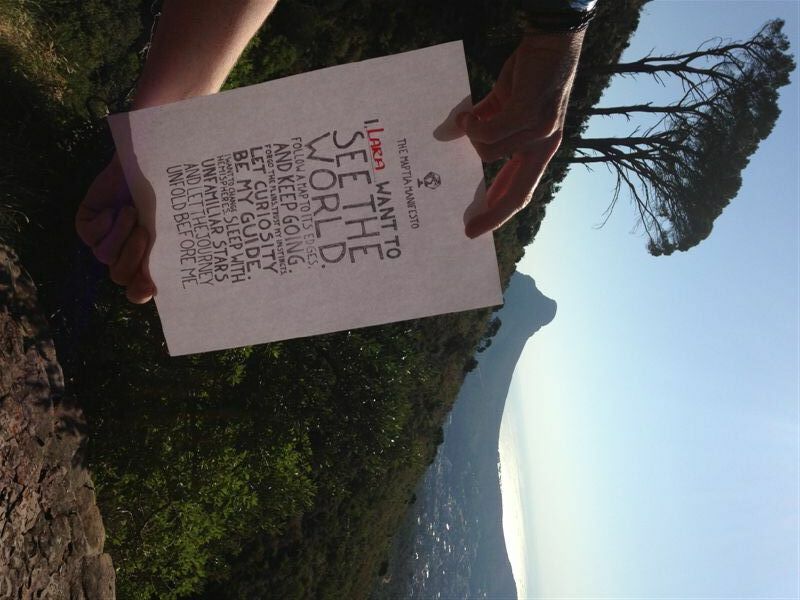 For those who don’t know the Maptia Manifesto (as seen on the photo below) is on a quest to help the manifesto travel the world and with this photo that I tweeted to them yesterday, Cape Town is now officially on the map. 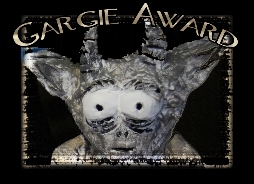 If you would like to see, click this link and then click on “See the gallery”. The Maptia Manifesto: “I want to see the world. 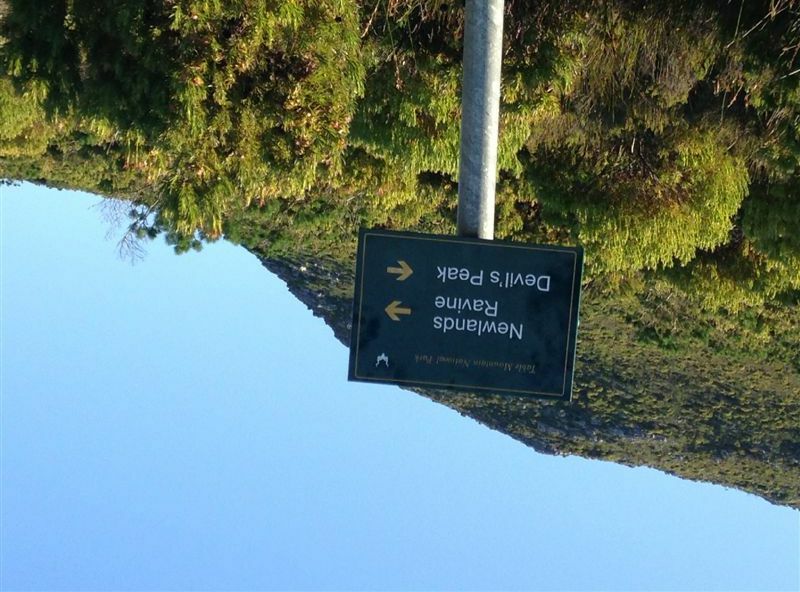 Follow a map to its edges. And keep going. Forgo the plans. Trust my instincts. Let curiosity be my guide. I want to change hemispheres. Sleep with unfamiliar stars and let the journey unfold before me.” ~ Yes, please!! That is definitely my kind of manifesto! I told them I would like to take this manifesto with me to the summit of Aconcagua in January 2014 for them. They loved the idea, watch this space! Almost at the end of the trail, right before the last few stone steps that would bring us out on the road where our car was parked, I stepped down and without warning my right foot rolled at the ankle to the right sending a shooting pain through my ankle over my injury where I rolled it twice on the Smitswinkel hike a few month backs. 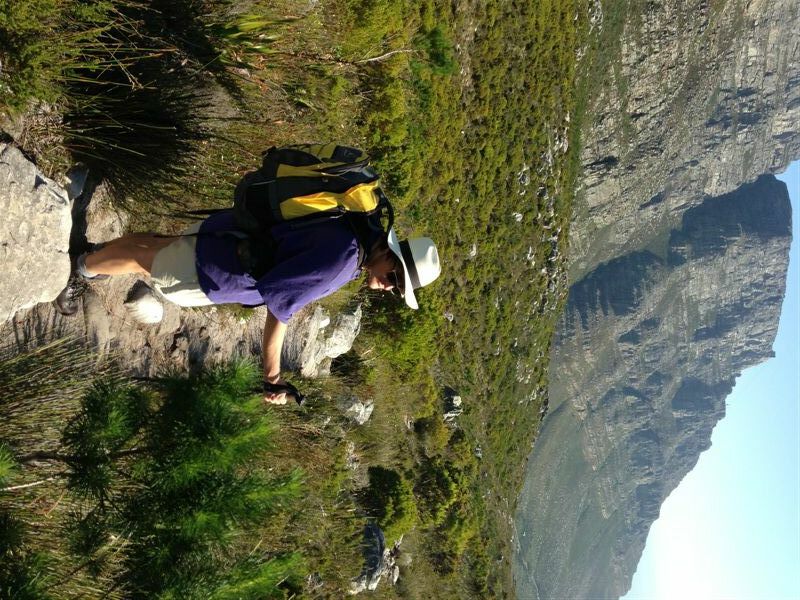 It was so painful I double over my trekking poles and a few choice words came out of my mouth! Why do these things always happen just as you “getting home?” It was a frustrating feeling, my ankle took forever to heal the last time and it still swells up occasionally. Although last night it ached, I am happy to say besides some minor swelling, there is no pain today. I must remember in future to strap that ankle up before I hit the mountain as I would really hate to injure myself with a mountain like Aconcagua looming before us. Today I am feeling sore, yet totally exhilarated from our time on the mountain yesterday. My shoulders are stiff from the heavy backpack and my quad muscles stiffen up when I’ve been sitting for too long, causing me to do some fancy foot work when I stand up again, quickly reminding me of the hard work we did yesterday on the mountain. This morning at home before leaving for work, I crouched down on my haunches thinking I wasn’t feeling too stiff, but in the fastest motion with a yelp of agony, I landed on my bum on the floor. Hahaha, I have some serious work to do to get this body back to being mountain fit. My quad muscles have been awakened and this was my reminder! Needless to say I won’t be crouching down on my haunches for the next few days! This coming Sunday our Aconcagua team is meeting up to work on our proposal and to get things moving forward for our epic adventure that awaits in January 2014 and the Sunday following that we will head out to Blackburn Ravine for some more fun and games (read that as torture), hopefully this time slightly less. I think he should be careful what he wishes for!! Previous Far Too Beautiful To Ever Forget! Next It’s Time To Turn Up The Volume ~ Happy ChooseDay! Hello Avril! I’m so glad you enjoyed the post. Sometimes, when the going gets tough on the mountain I wish someone could be talking me through it too instead! :) Thank you for the good wishes, so excited for what lies ahead for the team and I.